If you are unsatisfied with our product simply contact us within 7 days of the delivery date to obtain a full refund (excludes 4 kg bags). Notification by email is required, please note that if you are returning multiple items, all other bags must be unopened and returned. At 180 Nutrition we really value our customers and their health. We would like to offer our loyal customers* reward points for their purchases which they can then redeem for products. 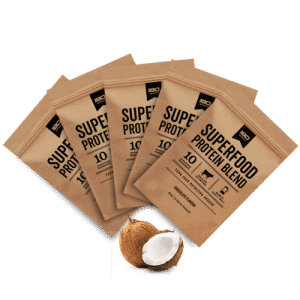 For example for every 1.2kg bag of Superfood Protein Blend you buy you will receive 10 rewards points. You need 100 points to redeem a 1.2kg bag, so you get the 11th bag FREE! *Customer account needed to gain points. 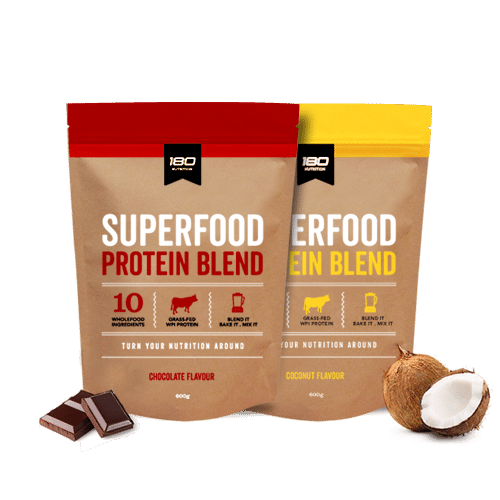 Note: Reward points are not available on all starter packs and boxes of 180 Superfood due to the existing discount that already exists. The purest form of whey protein isolate, containing all the essential amino acids. Flaxseeds are a great source of Omega 3 and fibre, which helps you go more regular. Almonds are one of the most nutritious nuts and are bursting full of healthy fats and antioxidants. Are full of Omega 6, which is great brain food, and helps reduce inflammation. Packed full of essential fatty acids to help your body reduce inflammation. 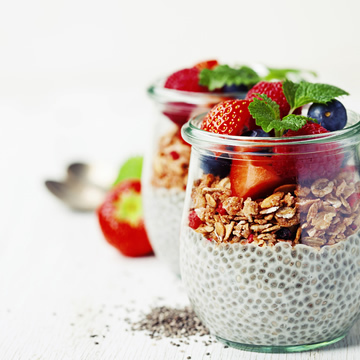 Chia seeds are packed full of omega 3, antioxidants, vitamin C and iron. Is high in gut loving fibre that slows and aids in digestion and pre-biotic goodness. Is a natural sweetener that is fructose free and doesn’t spike blood sugar levels. 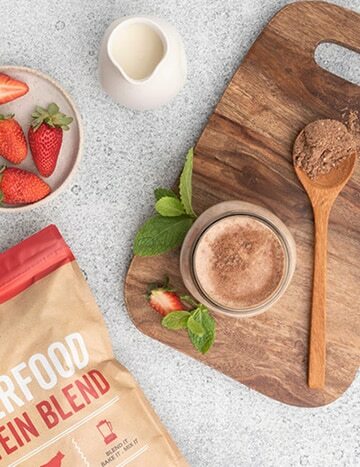 Blend It: Simply mix 1 serve of superfood with your choice of milk or water, add your favourite fruit or veggies and blend to make a nutritious smoothie. 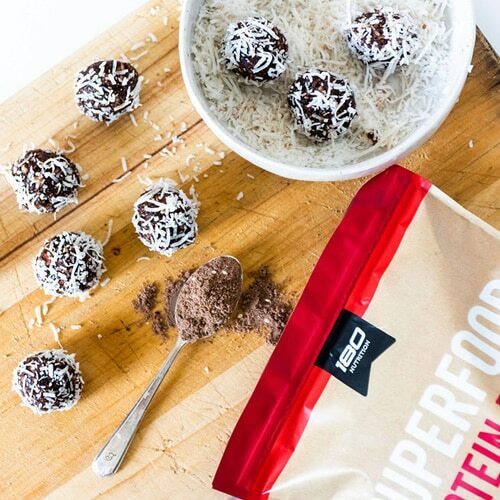 Bake it: Use it to replace flour when baking to create amazing superfood snacks, we’ve got hundreds of recipes online to show you how. Mix it: Supercharge your favourite breakfast bowl to add more protein, healthy fats and filling fibre. It’s perfect with muesli, oats or simply yogurt and fruit. 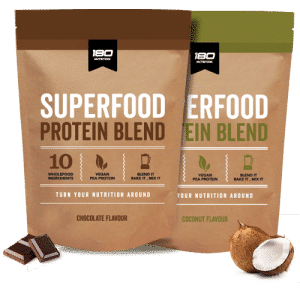 When should I take the Superfood Protein Blend? A 180 smoothie makes an 'amazing' breakfast as it allows you to quickly replace the usual refined and processed high sugar options that leave you scrambling for food an hour later. You can also use it as a natural meal replacement, a tasty snack throughout the day or after exercise for a deeply nutritious post-workout smoothie. Is it OK for kids and how much should I give them? 180 is perfect for kids as it's 100% natural with no hidden ingredients sugars or colours that will send them into a frenzy. It'll keep them full, provide healthy protein, fats, vitamins and minerals which can't be said for the usual chemical laden 'kids snacks'. You can give them as little or as much as you like as it's real food, it just depends on their appetite. Is it OK to take in pregnancy or breastfeeding? The answer is yes. The extra protein, essential fatty acids, fibre and minerals will be of benefit to you whilst pregnant or breastfeeding. Which blend should I choose, Vegan or Whey? Our Whey Protein Isolate (WPI) blend is low-lactose and makes a great choice but if you are strictly adverse to dairy then our vegan version is a great place to start. What about whey protein and dairy intolerances? We use grass-fed whey protein isolate with no milk solids, meaning the protein is isolated from the rest of the dairy. While there are traces of lactose in the blend, many people who are lactose intolerant are happily using 180. We also offer a vegan version that is 100% free of dairy. How much protein is in each serve? 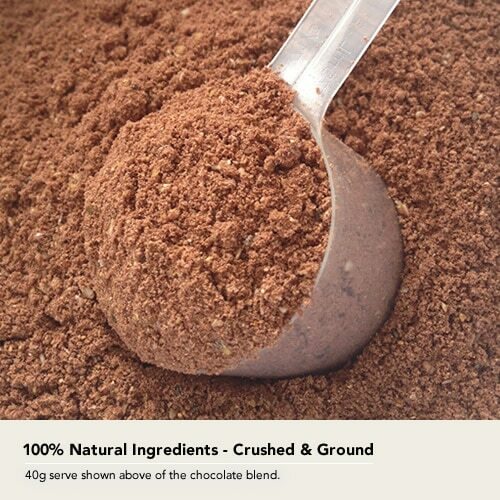 A 40g serve of our Superfood Protein Blend provides 22.9g of protein. What is the shelf-life of your Superfood Protein Blend? 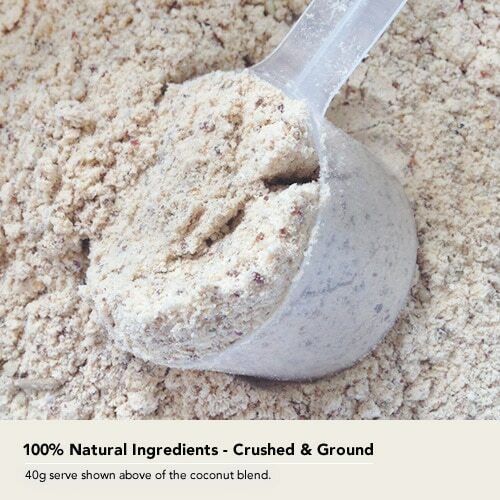 Our Superfood Protein Blend has a 2 year shelf life if stored in a cool, dry place and kept fully sealed. Will it help me lose weight (body fat)? Yes. If you want to lose body fat and sustain/improve good health, we suggest swapping one of your daily meals with a smoothie. Breakfast is a great place to start, If you have cereal or toast for breakfast, or any processed carbohydrate simply, replace these with a superfood smoothie. You’ll be amazed at the difference in no time at all. Can I use this as a pre/post workout supplement? Yes, we recommend taking a 1/2 to full serving an hour before exercise and a full serving within 1/2 hour after workout. If you are doing intensive exercise, we recommend taking it with some fruit, like a banana or berries. What is the protein to carb ratio of this? 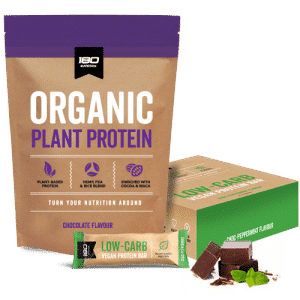 180 Nutrition is 100% owned and operated with all of our products made in our factory just outside of Byron Bay in New South Wales. 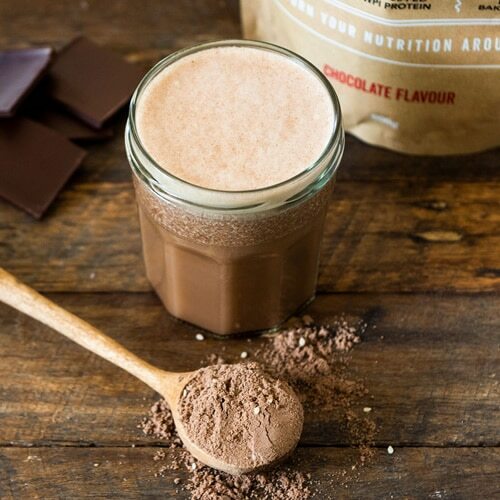 Could this be the Best Chocolate Smoothie Ever? 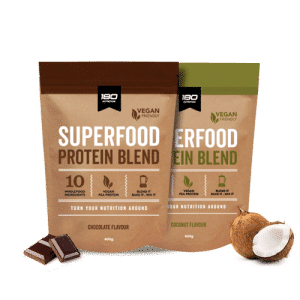 Our Superfood Protein Blends have a lot less sugar than a smoothie, are way more filling that meal replacement formulas and unlike protein powders, they’re packed with REAL FOOD. Perfect for the whole family too. I stumbled across this site when I was looking for gluten free protein recovery supplements which complimented my primal eating as I currently workout around 4 times a week and play soccer and i was recommended to have a protein shake after training… .. the horrible selection recommended in the fitness industry has wheat, chemicals and god knows what else lurking in there it made me uneasy.. so I was relieved to find a product that is sugar free, has no chemicals, HAS fibre, no preservatives, is natural tasting with ingredients that you can see, pleasant nutty taste, easy to drink with water, in a smoothie and I cant wait to try out some of the recipes on this site using this protein powder. PLUS it was delivered to me within 2 days after I ordered. fantastic service, will def buy again and will recommend to all my friends to try it and see the difference. Well done team for bringing this product to the masses! You guys rock! Finally a product that doesn’t scare me into thinking I will become the ‘Incredible Hulk’. 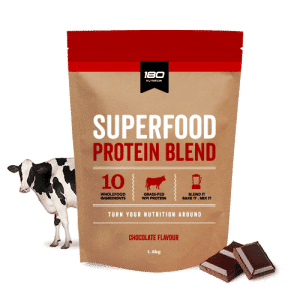 I work out a lot as a Personal Trainer, group instructor and exercise lover and without 180 Superfood Protein Blend I don’t think I would make it through the week. It is the first female friendly natural protein supplement I’ve found that aids in my weight loss and maintenance, muscle recovery and increased energy levels. Adding 180 to my daily smoothies and other meals keeps me fuller for longer as the energy is released slower and ultimately stops me from those naughty cravings and weight gain, it’s my new best friend. 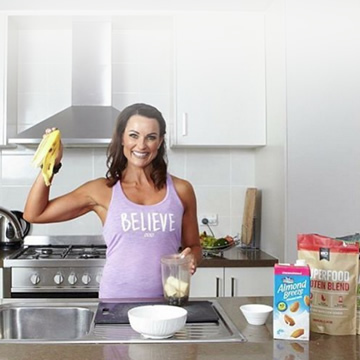 180 Superfood Protein Blend has been on trial at the Sydney University – UTS Fitness centre. This has been the perfect testing ground as we wanted people who put extreme demands on their body. The UTS Fitness centre has a high amount of sport scholarships and competitive athletes, ranging from track & field, rugby, rowing etc. It also has body builders, weight lifters and people who just train to stay healthy or lose body fat. Our feedback has been nothing short of fantastic!!! Those who used it as prescribed, all reported improved recovery, more stamina, lean muscle, energy and strength during training. And for those carrying unwanted extra % body fat showed a reduction by 2% or greater over a month by simply replacing 2 of their 6 small meals a day with 180. I use protein between meals to aid with weight management and I am very ANTI-SUGAR. This product does the job very well. 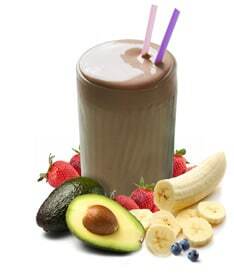 Taste great in a smoothie (my favorite is to have the choc mixed with banana and crushed ice or coconut with raspberries and crushed ice). Feels better to use a product that does not make me nervous about chemicals. Great product, look forward to using it in may more ways!! 180 Nutrition is now a part of the whole family breakfast routine, it’s quick and easy and taste’s delicious! I love it with natural yogurt, strawberries or raspberries for a tasty start to the day. Even the family cat will track you down in the mornings for his share of anything left in the bowl! In a market flooded with protein powders and supplements that are filled with artificial flavourings and chemicals it is great to find a product that I can recommend to my patients that is based on quality natural ingredients and manufactured to the highest standards. 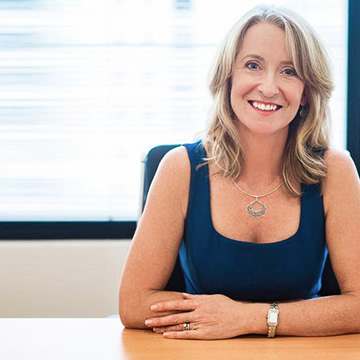 The usual Australian diet is high in refined carbohydrates which encourages an unhealthy muscle to fat ratio which ultimately contributes to many disease processes. Helping patients balance their protein to carbohydrate intake makes a big difference in their health as does the extra boost in nutrients, essentials fatty acids and natural fibre that 180 nutrition provides. I would recommend 180 nutrition to anyone who is interested in maintaining a balanced diet and achieving optimal health. So I’ve decided to put myself on a detox. With the changes in season, I usually get a congested t-zone (breakouts & dull skin) and weird changes in hunger levels (I can EAT A LOT! anything with ice cream… game over!). In an attempt to prevent or react early to these changes, Ive decided to put more of an effort into making healthy smoothies in the morning for brekkie, cook nourishing foods for lunch & dinner and try to SLEEP early. If I’m feeling tired after training (usually the case after a PT session!) I’ll have a big 180 smoothie with coconut water and flesh or 180 Superfood & natural yoghurt.